The Georgia Labor Market Explorer predicts a 36 percent increase in demand for Pharmacy Technicians during the years 2006 through 2016. 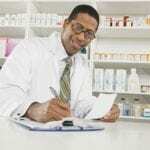 While Pharmacy Technicians don’t need licensing or special certifications to work in the field, the Georgia Board of Pharmacy recognizes certification administered by the Pharmacy Technician Certification Board (PTCB) through a nationally certified pharmacy technician program. There are more than 50 schools across Georgia offering pharmacy technician education programs. Two-year community colleges account for 21 percent of the programs and private, vocational colleges, and medical training schools make up the rest. Some Georgia Pharmacy Technicians opt for voluntary certification to increase their earnings and job opportunities. In order to obtain certification from the PTCB, students must pass a computer-based examination administered by Pearson Vue. Atlanta Technical College’s Pharmacy Technology program prepares graduates for employment in positions where they’ll need to prepare medications according to prescriptions under the direction of a pharmacist. The course covers fundaments of English, basic math, basic psychology, anatomy, introduction to healthcare, medical terminology, pharmaceutical calculations, pharmacy technology fundamentals, principles of dispensing medications, principles of sterile medication preparation and pharmacology over 56 contact hours. Apart from classroom lectures, students must complete 450 hours of practicum in order to graduate. Applicants must be at least 18 years old, have a high school diploma or GED equivalent and have no felony convictions in the last 10 years. Upon completion of the program, students have the option to take the Pharmacy Technician Certification Examination (PTCE). Tuition and expenses amount to $2673 inclusive of books, CPR card, exam fee, background check, drug test, insurance, uniform, and Pharmacy Technician Registration. The academic and clinical components of Everest College’s Pharmacy Tech program helps students develop in the area of pharmacy administration, pharmaceutical calculations, nutrition, pharmacology, health care systems, medical terminology, respiratory, digestive and reproductive systems and anatomy. At the end of the 35-week program, graduates also demonstrate strong communication and interpersonal skills to relate to customers, co-workers and other health care professionals. Applicants to Everest’s program must demonstrate strong mathematical skills to manage inventories and measure medication. Tuition is $12,778 and books and fees are $1,226. Brown Mackie College offers an Associate of Applied Science in Pharmacy Technology that covers 96 credit hours. The program comprises of classroom and clinical experience to help students prepare for a career where they can assist with dispensing medication under a pharmacist’s supervision. Topics include elements of microbiology, medical terminology, medical math, introduction to biological chemistry, pharmacy operations in the hospital and community, medical ethics, principles of sociology, principles of psychology, business communications and composition. Students can complete the 96 credits in as little as 26 months. At the end of the program, students can take the (PTCE). At $366 per credit hour, the total cost of tuition is $35,136 exclusive of textbooks, uniform and other expenses. Financial aid is available for qualifying students. Palmetto School of Career Development’s 12-week Pharmacy Technician training provides students with 36 contact hours of classroom instruction. The course prepares students to enter the job market after gaining knowledge and skills in the areas of processing and recognizing drug orders, controlling pharmacy inventory, pharmacy calculations, pharmacology, the NDA process, sterile product compounding, pharmacokinetics, and laws that affect pharmacy. Tuition is $1,275 inclusive of registration. A flexible payment plan is available for all students. At Fortis, Pharmacy Tech students learn how to read, fill and distribute prescription drugs. They also learn how to calculate pharmaceuticals and about common drug interactions and their side effects. Graduates understand the legal responsibilities of record maintenance and handling different categories of drugs. Tuition is approximately $14,576 plus $1,436 for books and supplies. The accelerated Pharmacy Tech course at Medical Career Specialists may be completed in 5 days but also includes 3 weeks of access to online materials for advanced self-study. The course curriculum prepares students to dispense prescription drugs, use medical devices, and disburse information on the proper usage of certain drugs. Students also learn the basics of administrative duties, such as reviewing prescriptions requests and following up with payments from insurance companies. At the end of the training and online self-student, students can take the PTCE and apply for an entry-level position at a hospital or community pharmacy. Tuition is $2,399 inclusive of lab fee, materials and textbooks.